Who does not love apple pie? At least, good apple pie, because there are tearooms in museums or train stations where I have seen very sad, sometimes even partially defrosted prefab apple pie. Like apple sauce, apple pie is one of the basic, primeval dishes of European cuisine (here is a medieval recipe for an apple pie of Dutch origin). The apple pie on this page is from The Art of Cookery Made Plain & Easy by Hannah Glasse. More on this cookbook can be read on the page with the recipe for Marzipan Hedgehogs. The phrase on the picture to the left is from a letter Jane Austen wrote to her sister Cassandra on October 17, 1815. The picture itself is a portrait of Jane from behind, made by Cassandra. In The Oxford Companion to Food, Alan Davidson mentions that the word pie was originally magpie, because the first pies were stuffed with all kinds of ingredients, just like the magpie adorns its nest with glittering things. But he does not mention a source to support this. Samuel Johnson offers other possibilities for the origin of pie in his Dictionary of the English Language from 1755: a contraction from pasty, and a derivation from pied (French for foot). The Online Etymology Dictionary mentions magpie and pastry (instead of pasty), but not pied, as possible origin. A pasty originally contained just one ingredient, say a whole capon. But both pastyand pie were closed with a pastry cover. The distinction already gets blurred in the Middle Ages, when there were pies with one main ingredient and pasties with many ingredients. Modern pies don’t even need to have pastry covers, but instead for example a topping of mashed potatoes. According to Davidson, American pies have no topping at all. I chose this pie for a tasting after a presentation I gave on food and drink in Jane Austen’s time. I started out with a recipe from The London Art of Cookery (first printed in 1783), but quite soon I found that this was a heavy case of plagiarism and hackwork. Using recipes from one’s predecessors or colleague-writers is something that happens very often. Indeed, it is nearly impossible to write a completely original recipe for something like this apple pie. One looks at the recipe, adds something, alters something, leaves something out, clarifies instructions, and voilà: it is now your recipe. I, too, look up different versions of a dish for my modern recipes before starting to write my own version. But when copying a recipe verbally, one should at least mention the source. The London Art of Cookery appeared in 1783 under the name of John Farley, cook at the famous London Tavern. This popular cookery book was reprinted several times, and praised for its excellent recipes. I first saw this recipe for apple pie in Cooking with Jane Austen of the American historian Kirstin Olsen who also wrote the Austen-encyclopaedia All things Austen. Her book is a treasure trove of recipes and information. She used John Farley as the recipe’s source, using such phrases as “Farley recommends” and “Farley’s recommendations”. In my search for information on John Farley, I read some articles by Fiona Lucraft that were published in 1992 and 1993 in the English culinary periodical Petits Propos Culinaires (PPC). Her conclusion was that, but for one recipe, all Farley’s recipes had been copied from other cookery books. And in 1998 Peter Targett revealed, also in PPC, that the actual author/compiler of the book was a hack writer called Richard Johnson. This man is also the real author of The Universal Cook from 1792, which according to the title page was written by F. Collingwood and J. Woollams, cooks in the Crown and Anchor Tavern in the Strand. By the way, Hannah Glasse herself also took almost a third of her recipes from other sources, mainly from The whole duty of a woman […] from 1737 (first published in 1701), and that book in turn borrowed from yet older publications. It is hard to be original when writing cookery books! Below are the versions for Apple Pie from Hannah Glasse (edition 1747, p.114) and John Farley (edition 1811, p.209). The recipes for the pie are practically identical. The recipes for puff pastry are reproduced on another page. The difference between the letters f and the old-fashioned long s is minimal, but it’s there. So it doesn’t read ‘puff-pafte’ and ‘fugar’, but ‘puff-paste’ and ‘sugar’. That long s was just another way of representing the letter s. Both shapes were used; at the end of a word you see the modern ‘snaky’-s. You could compare it to different shapes for lower case and upper case (a and A): there is no difference in meaning, the choice for one shape or the other is defined by the position of the letter in a word or sentence. One can use home-made puff pastry or use ready-bought. But one can also use the original recipe from Hannah Glasse. In the original pie-recipe the custard is only used for a pie with pears, but I used it with apples too and that was delicious. For a pie mould with a width of 24 cm (9½ inch); preparation in advance 30 minutes; preparation 60 minutes. Buy or prepare the puff pastry (the recipes from Glasse and Farley are here). Prepare the stuffing – Pour boiling water over the lemon to remove the wax, and grate or cut the lemon peel. Squeeze the lemon. Rinse the apples (or pears), peel them, remove the cores and cut in wedges or slices. Immediately put the peel and cores of apples or pears in a pan with a cup of water, and the fruit itself in a bowl with 2 to 3 tablespoons lemon juice and the grated or chopped lemon peel. 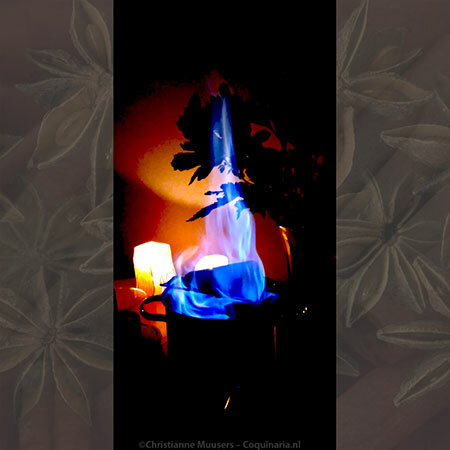 Bring peel and cores to the boil with a piece of mace, temper the heat and simmer for fifteen minutes. Strain the liquid, discard peel and cores. Add 4 tablespoons sugar to the liquid and reduce to about half. Keep watching, because if too much liquid evaporates, it won’t be syrup but candy. Preheat the oven to 220 °C/430 °F. Prepare the mould – Butter the mould well. Divide the dough in two portions. Roll out the first part on a worktop sprinkled with flour. Drape the dough sheet in the mould; let it hang over the side. Keep the other portion wrapped in plastic foil. Fill the pie – Drain the apple or pear pieces well and mix in two tablespoons sugar. Arrange them on the bottom of the pie and add the cloves. At the last moment before covering the reduced syrup is added. 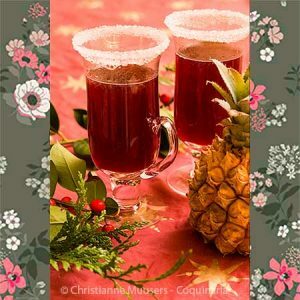 Apple pie – Optionally, you can add a little quince jelly to the apples. Cover the pie – Roll out the second dough sheet and cover the pie with it. If you plan to add custard after baking, do not press both sheets together. Decorate the cover or not, as you wish. Be careful with glazing with egg, as it can burn black at high temperature. Bake the pie – Place the pie low in the oven, and bake for about 25 minutes. The time can vary with different ovens, start checking at twenty minutes, but it could also take a half hour. Pear pie and Apple pie – Prepare the custard while the pie is in the oven. Beat two egg yolks with 250 ml/1 cup haevy cream and one tablespoon sugar. Grate some nutmeg into it. Heat this in a saucepan until the cream has thickened. Whisk all the time to prevent clotting. Once the custard is right, pour it into a bowl and cover with plastic foil directly on the hot custard to prevent the forming of a skin. 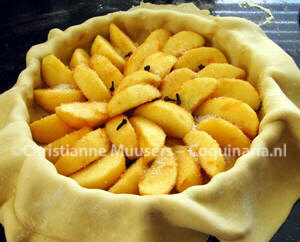 Remove the pie from the oven, carefuly lift the cover and pour the slightly cooled custard over the pears (or apples). Cut the cover into wedges and stick them upright around the sides. If the cover is too soft because of the moisture in the pie, you can put it back in the oven for a while. This pie can be served warm as well as cold, but luke-warm is the way I like it best. If custard is not added to the pie, the pie can be served with a separate bowl of cream, whipped with cinnamon and sugar. Or do both, as you prefer. The custard can also be served separately as a sauce. 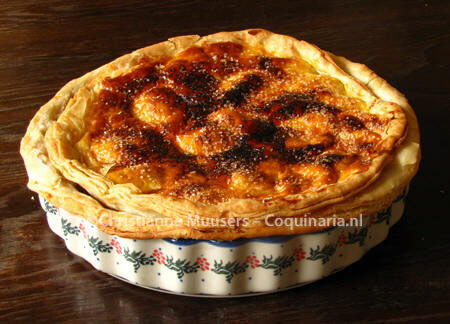 In the eighteenth century this pie was served during the second course, together with meat, fish and vegetable dishes. In the Netherlands apple pie is most often baked in a metal spring form. The pie is removed from the form before serving. 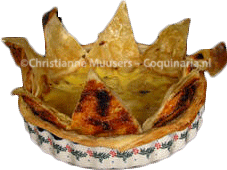 But if the pie is baked in a decorative stoneware pie mould, it can be served in the baking dish. Use heavy cream, with a high percentage of fat (at least 35%). Too much fat? Just take a smaller piece of pie. 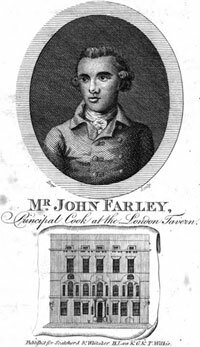 ‘John Farley’, The London Art of Cookery and Housekeeping 1783. Online edition. Hannah Glasse, The Art of Cookery Made Plain and Easy (first printed anonymously in 1747) Facsimile edition with introduction, glossary and explanatory notes: First catch your hare […], (Prospect Books, 1995, 2012 – Attention: other facsimile-editions lack any introduction or notes, in that case you can just read the online edition and save the money. Peter Targett, ‘Richard Johnson or John Farley?’. In Petits Propos Culinaires 58 (May 1998) pp.31-33. 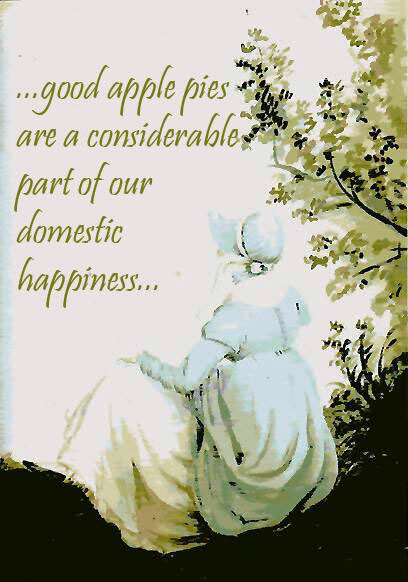 Apple pie was a favourite dish of Jane Austen. 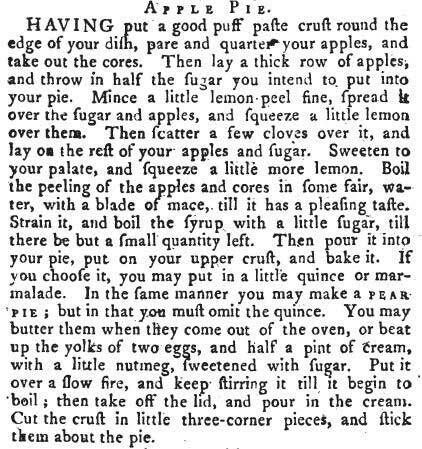 This is an 18th century recipe for apple pie from Hannah Glasse.